ConvertXtoHD is a one-click solution to convert and burn your movie files to a BD disk playable on any Blu-ray player. You can also create AVCHD disks too. ConvertXtoHD supports all video format, including Blu-ray to make copies and supports subtitles. Equipped with a fast and quality encoder you get excellent results quickly. If you do decide to edit your videos or change any settings a live preview will help validate any editing you do to your video before the conversion. Various setting to change brightness/contrast/sharpness and image enhancer too. You can create your own menu, merge files, add custom chapters, remove unwanted parts of the video such as commercials, rotate videos, and includes an audio normalizer. 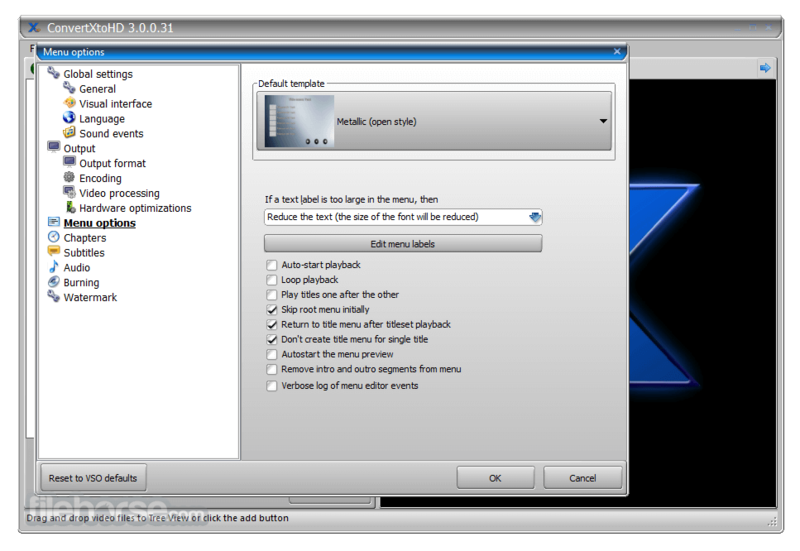 Multiple audio and subtitle tracks are supported. Subtitles can be converted as external subtitles or embedded into the video, and can be tweaked to your desire: color, font, code page, positioning and so on. Audio, video, and subtitle synchronization can be corrected with an easy to use' offset' feature. Professional type settings are available like adding an intro video to play before loading the main menu or add a watermark/copyright to videos. You can change your output size and encoding quality and select the resize filters you want to be used. Hardware encoding and decoding technology is included to lighten the CPU's load and get faster conversions. For the final step, save the conversion to your hard drive, burn to ISO or Blu-ray, single or double layer disk, any brand of disks with any brand of burners. Set up your favorite burning settings. ConvertXtoHD is available in multiple languages. User guide included and VSO support guaranteed for your slightest problems. Burn to any DVD or Blu-ray disks - all formats and sizes supported: DVD +/- R, DVD +/- RW, DVD +/- RW, DVD-5, DVD-9, BD-R, BD-RE, BD-25, BD-50. Note: 7 days trial version. Aafter that, you can still use it, but a watermark is inserted in the converted video.